Well, 143,253 froggings later, I finally have some toes that I like. And here they are. Or at least the start. These are here to stay, I think. This is similar to the toe that I did on the Basket Weave Socks except I’m working more plain rows between increase rows. One plain row between the 1st and 2nd increase rows; two plain rows between the 2nd and 3rd increase rows; three plain rows between the 3rd and 4th increase rows; etc. As always, clicking on the picture pops up a bigger version where you can see the knitting more clearly. We had just a few minutes of sunshine this morning – just long enough to snap this pic. The sun is gone again and showers are threatening. I love Portland in the spring. Jen the Knittingspaz remarks: I love that you managed to fudge the heel flap and gusset heel so that it would be toe up. Iâ€™ve wanted to try this for a while, but havenâ€™t gotten the nerve up yet. bfmomma asks: I love toe-up socks so much more than cuff-down, but I keep miscounting on the wrapped short-row-heel. Is it possible youâ€™d share the way you did this heel toe-up? I should probably note that I usually do a flap and gusset heel on all my toe-up socks. It’s just that I usually do a different kind. 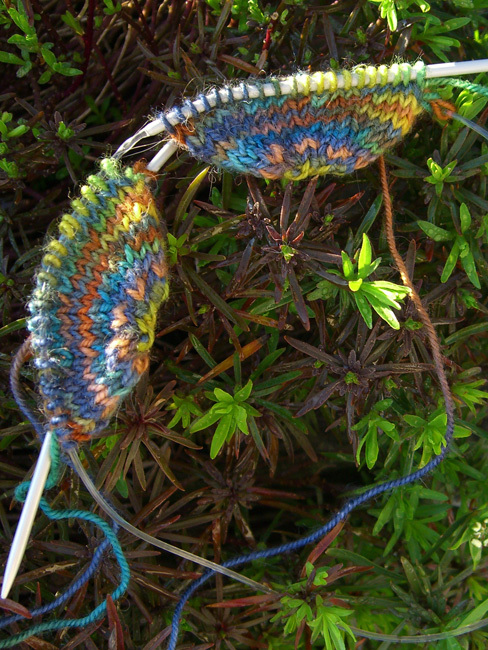 The heel on the cabled socks was one that I hadn’t worked before. There are several free patterns available on the web that are toe-up and have a flap and gusset heel. One is Judy Gibson’s You’re Putting Me On Socks. This pattern has the gusset and heel flap I usually work. On the heel turn, this pattern decreases stitches and then picks them back up. I usually short-row. But this would be a good pattern to start with. The pattern I’m working on right now will be available, probably in mid-June. I hate to ask you to wait, but it will be easier to explain the heel in a pattern so you see it in context. The heel flap itself is worked the same way as the pattern above, but the gusset and the heel turn are completely different. Turn the needles and wrap the stitch, slipping the wrapped stitch to the right needle. Place a marker. Purl (or knit, depending on which side you’re on) across to the next turn. Wrap the stitch and turn. Slip the wrapped stitch to the right needle. Place a marker. Knit (or purl) across to the marker. The stitch to the right of the marker is the one that you want to wrap. Remove the marker, wrap the stitch and turn. Slip the stitch to the right needle. Replace the marker. Just keep repeating that last step until you’ve worked all of your short rows. Knit (or purl) across to the next marker, remove the marker, knit the next stitch, replace the marker and turn.